Only about 150 examples of the 1921 St-Gaudens Double Eagle survived the gold recall of 1933. Production of the St-Gaudens Double Eagle continued through 1933. Many pieces from the 1920’s and 1930’s never left US Treasury vaults. Some were shipped to other countries during international transactions. The gold recall of 1933 resulted in the melting of millions of gold coins. Some of the dates stored in Treasury vaults were very nearly eliminated completely. One such date is the 1921 St-Gaudens Double Eagle. Despite an initial mintage of 528,500, only about 150 exist today. It wasn’t until 1947 that the extreme scarcity of the 1921 Double Eagle was fully realized. In responding to an inquiry from a collector, the Mint confirmed that all but 25 of the 1921's were destroyed. It turns out about six times that number survived – nonetheless, a very rare (and popular) date indeed. 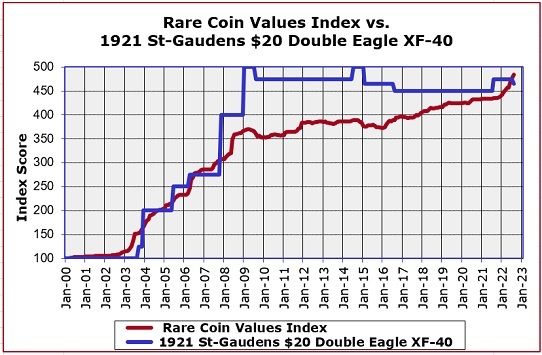 The blue line above charts the percent increase in retail price since Year 2000 of the 1921 St-Gaudens $20 Double Eagle in XF-40 condition. The price hikes are consistent and impressive, increasing in value many times. The red line measures the percent price increase over the same time period of our Rare Coin Values Index, which is comprised of a representational group of 87 rare US coins. The purpose of maintaining the Index is to estimate the direction of the rare US coin market in general. The 1921 Double Eagle is one of the 87 coins tracked in the Index. The Index is updated monthly.